Or just anything which has been space-flown. Rolling back several decades, you could specialise in mankind's earlier quest to leave the ground in a plane as achieved by the Wright brothers. Then again, you could be like collector Michael P Wright and specialise in pretty much everything. 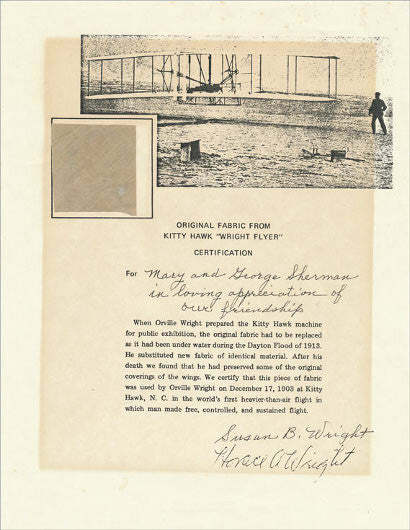 Wright's eye-popping space and aviation memorabilia collection begins time-wise with a swatch of fabric from his namesakes' creation: the historic Kitty Hawk Wright Flyer. Created by the Wright brothers and flown in 1903, this was the first powered, heavier-than-air machine to achieve controlled, sustained flight with a pilot aboard. The modern Wright is clearly extremely proud of the swatch, describing ownership as a 'privilege'. A sample of material that the Wright brothers can never have imagined owning dates from six and a half decades later: an Apollo 11 sprinkling of moondust rescued from the Sea of Tranquillity. That is by no means the only piece of memorabilia from the Apollo missions, however. There are flown maps and checklists, including one annotated by Neil Armstrong and Michael Collins on their way to the moon. Perhaps a completely unique collection within the overall hoard is a collection of flown film fragments from every manned Apollo mission - all 11 of them. The fragments from the six missions that landed on the moon are all from film that was actually used on the lunar surface. Despite all these great collectibles, it is surely the autographs which are the most impressive. Indeed Wright has achieved something few other space collectors would even dream of. He has collected not just the signatures of all 12 moonwalkers, or of the most pioneering astronauts, but those of every single individual who has ever flown in space. 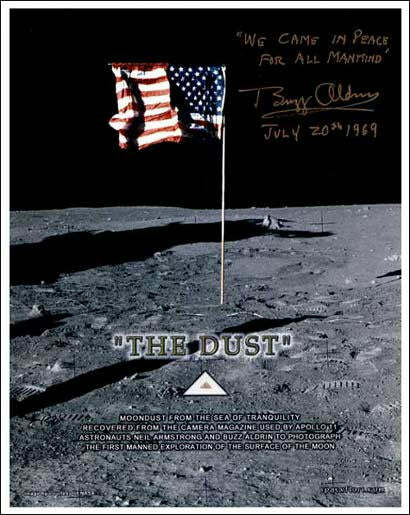 The series opens with a signed cover by Yuri Gagarin, then continues with three signed pictures by Alan Shepard, Gus Grissom and John Glenn, with a signed cover by Gherman Titov in the mix. Familiar poses of Neil Armstrong, Michael Collins and Buzz Aldrin have all also been signed, but they are listed not against the Apollo 11 legend but their first space flights on different Gemini missions. The list currently ends with Satoshi Furukawa, who left the atmosphere in June 2011 and has provided a signature on a cover. Even featuring an online introduction by Apollo 16 moonwalker Charlie Duke, Wright's collection must be the greatest of its kind in the world, and does much to support its aim of 'keeping the dream alive'.